On a summer afternoon right before I left for Buff, I sat in Riverside Park working my way through a couple of exquisite and wonderfully seasonal white peaches. I’d been out riding my bike – on a quest for something delicious to eat – when I stumbled across a farmers’ market overloaded with gorgeous produce, and realized that this was exactly what I’d been looking for. It was then that the idea for this column was born – the by-product of the by-product of peachy fructose and the sun setting over the Hudson River out toward New Jersey (where these particular peaches were grown). Market Report is a new column that will begin appearing on my blog regularly on Fridays. Focusing each week on a different fruit, vegetable or protein at the peak of its season, it will be a guide to New York’s myriad markets and what to look for when you’re there. As I travel, the Report will travel with me to cities across the globe. Next up? Vegas, baby! Does anyone know if there are farmers in the desert? This is how it all began: a bit restless, and with an unexpectedly free afternoon, I started to feel that certain hunger to have a food adventure – the sort of hankering that leads me on treks across the city (or sometimes, the country!) to wait in long lines (or sneak my way to the front of them) and otherwise bend over backwards for the right thing to eat. Without a definite plan, I hopped on my bike and started pedaling north up toward Riverside Park. The sun was bright and the sky clear; it was one of the first quintessentially summer afternoons of the season. As I rode, my hunger grew and I started to think seriously about lunch. As any dedicated NYC eater knows, just because the city is enormous, doesn’t mean that it’s not sometimes a challenge to find conscientious, high-quality food. At 132nd Street, I passed the epically decadent Dinosaur Barbecue (an uptown favorite, but the thought of eating my weight in garlic-chipotle chicken wings brought on fears that I’d barely be able cycle home) and decided to turn around. Perhaps a bit woozy from hunger, I left the park and started to cruise down Broadway. At the top of the hill at 120th Street I looked down and saw before me, like a desert oasis, a line of white-tented booths stretching along the block. Was it a mirage? 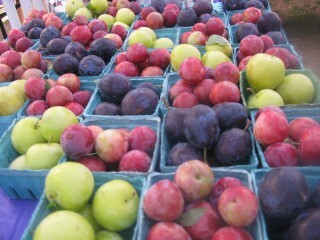 Or could it be the perfect antidote to my craving: a farmers’ market. As it turned out, I was in luck. Every Thursday and Sunday, all year round, a sizable green market assembles itself on 116th Street and Broadway, just outside the gates of Columbia University. I hopped off my bike and began to meander among the stalls. While not as huge as Union Square, the market still has everything you need – amongst the Upper West-Siders with strollers and the students in flip-flops clutching dueling dog-eared books and iPhones, the usual bounty of crates and tables crammed full of harvest produce abound. Many of the vendors are the very same who populate the Union Square Market on alternate days. I actually wish each market had a distinctive collection of vendors all its own, and certainly there are a few unique vendors to each location, but overall the NYC markets are just more of the same farmers hawking more of the same proteins and produce anywhere you go. But these days, they are in fact serving up something different. These days, they also have millions of peaches. 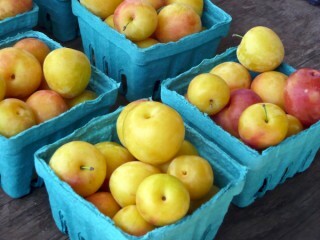 Stone fruits (drupes and drupelets, as you Alton Brown-type foodie nerds might have it) are available from early May through September, but they are at their very best right now, for the few short weeks from late July to mid August. From tiny, diabolically sweet yellow plums, flat little donut peaches and smooth nectarines, to the giant, golden beefsteak peaches you might mistake for apples if you’re not looking closely – now is the time to load up on these juicy treats…and make fruit pies! The best of the bunch will be tender and bright, with a wide cavity around the stem, which shows that they were picked ripe. I blanched the peaches in boiling water and then put them in iced water to make the skins slip off, then pitted the peaches and cut them in quarters. I added the sugar ,rum, absente, and brandy to the carafe and stirred with a wooden spoon til sugar was dissolved. I added peaches and stirred again. This will steep for 21 days . Stirring once a day. **the Wild Berry Cordial I made awhile back was so wonderful I couldn’t wait to try it again with peaches. Thanks for sharing your cordial recipe, Kathy! It sounds peachy!!! I made cordials a couple of Christmases ago and gave them out as gifts…one year I even did a homemade Irish Cream to boot. Both were big hits. 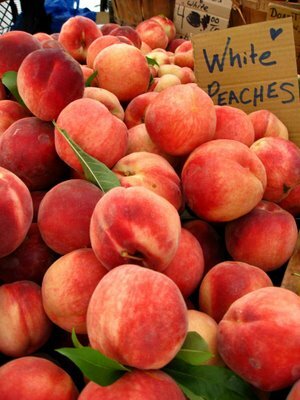 Who doesn’t like a little moonshine, and of course, peaches?? ?